Our Store is located in the heart of Whitstable town, a 5 minute Walk from our famous harbour. It seems word has spread of Harbour Street's charms, with its pretty little shop fronts; boutiques and Restaurants. Visitors come from far and wide for a stroll; a brouse and a look at the buildings, which have barely changed for over a hundred years. 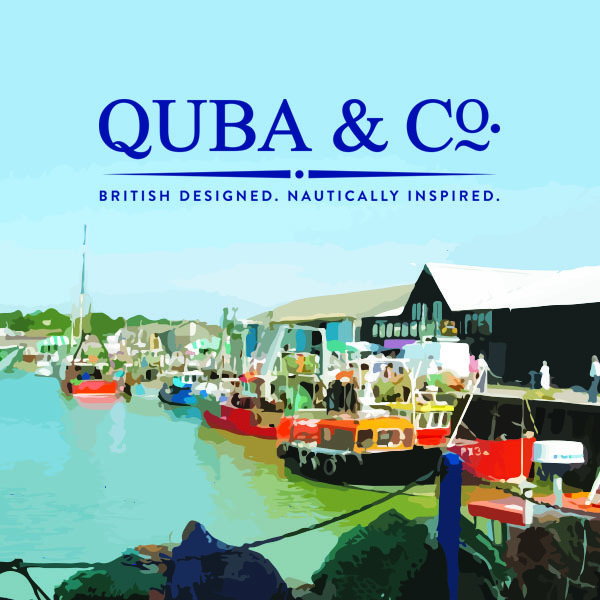 Here's a place where modern individual shops, including Quba Sails, shelter beneath uneven roofs. On some of the building's walls the original taxation stamps can still be seen carved into the stone (Quba still have theirs). Whitstable fish market is based on the South Quay of Whitstable harbour, againt a backdrop of fishing boats, nets and lobster pots. Seafood lovers can aquire the freshest fish and shellfish from the counters, whilst taking in the industrious yet captivating Whitstable harbour. During the summer months the fish market also adds to the hum-drum of the harbour, with fantastic barbecues showcasing locally sourced products wherever possible. If you're in town, drop by and see the range on offer, including the famous Whitstable oysters. The Horsebridge Centre puts on a wide range of events- such as Art-house film evenings, live music, comedy shows and art exhibitions. Also in Whitstable next to the Harbour there is a yacht club that is one of the oldest and largest sailing clubs in England. The club is situated on the North sea. WYC offers sailing in sheltered waters at all times of the tide for catamarans, dinghies and windsurfers. Whitstable castle, or Tankerton Towers as it was first called, started life as a residence for the Pearson family in the late 1790's and over it's long history it has been developed and improved by successive owners from 2008 to 2010. The castle and it's gardens were restored and revitalised with the help of over £2 million from the Heritage Lottery Fund's "parks for people" initiative and an extra £1 million from Canterbury City Council and other organisations in Whitstable. Today the Castle is managed by the Whitstable Castle trust, which is made up of a committed group of local people. The castle provides a unique and special venue for weddings, private parties, local classes, corporate and community events, including a puplic park complete with ornamental Gardens, play area and the castle Art Studio and Gallery. The Orangery Tea Room is open Tuesday to Sunday. There are interpretation boards telling the story of the castle and it's Whitstable history. If you're looking for a place to stay, Copeland House offers a 4 star bed and breakfast in a fine Georgian house that is situated just 20 metres from the beach, and just 150 metres away from the seafood restaurants, individual shops and galleries that make Whitstable such a unique town.